What do you do when that buck is just 10 yards too far away? The following is a post from a facebook friend of mine Bob Lauffer, who talks of a couple of his recent archery trips. Just returned from some tremendous archery hunting. I spent 5 days in Susquehanna County with my longtime friend Al. We hunted out of a teepee on top of the mountain and had a blast. I saw 8 different buck the first day we hunted but alas after 5 days all I have to show are memories of some great bucks out of bow range. 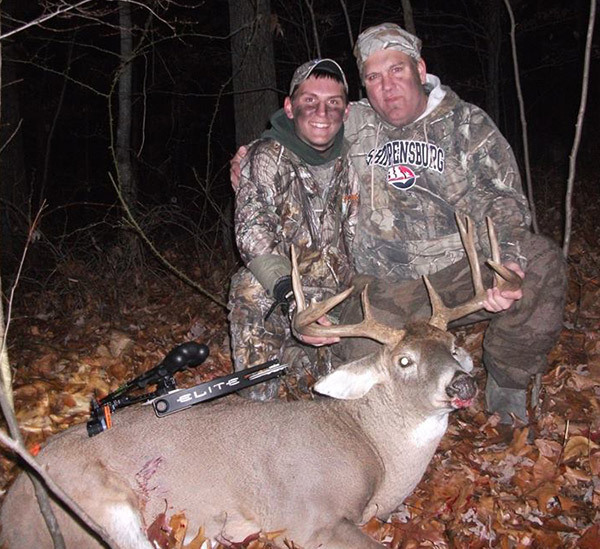 This past week I enjoyed a hunt in Ohio with my Archery M.D. Business partner and good friend Jared Smith and my son Reece Lauffer. Awesome hunt. Again I got to enjoy God’s creation and see some very impressive buck, just a little too far for an ethical shot with a bow. Reece scored on his best ever buck. His Elite Energy 35 was up to the task. He shot an impressive 9 point with two additional points broken off. These past two weeks were the first time I have really felt I was in “retired mode”since making it official July 1. I have been hunting for 48 years and was never able to get out for more than 3 days as I have always been in school. Time alone in a deer stand is when I do my best thinking and my best praying. When I returned to civilization I found two of those I regularly pray for we're facing new health challenges. It really puts my disappointment of that buck of a lifetime being 10 yards too far into perspective. Thankful for good friends and family to enjoy my passion for archery hunting with and even the adversity friends and family go through which draws us closer to God. As an avid outdoorsmen I sometimes need to be reminded to love the God of creation, and not just His creation.